Dogs are wonderful, and it's amazing how love and good training, as well as infinite patience, can transform them. It's harder with cats, but they can also learn to trust a primary human or two, even if they've been feral all of their lives. Cats are trickier, but as Guilie said you feel so special when they do decide that you're okay. Thank you so much for shining your Spotlight on It's About the Dog, Ellen! I hope you and your readers enjoy the post — and happy weekend for everyone! A rescue will need a ton more effort and consideration. You have to be that one person they can trust. And just dumping them in the water is a sure way to destroy that trust. They do take time and effort, but it must be such a good feeling to help them overcome their fears, adapt, and provide them with a loving home. You're right, Alex. 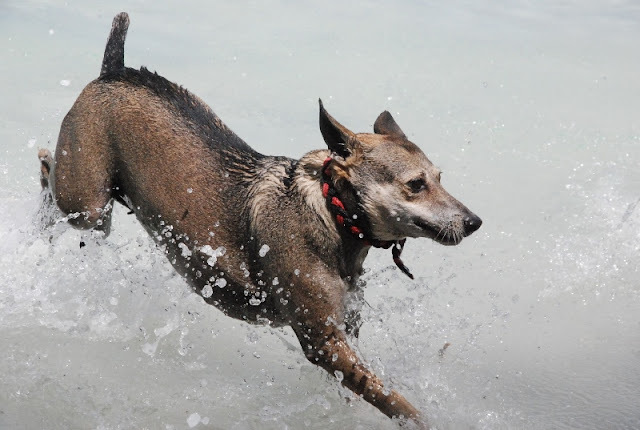 Some rescues do adapt to family life rather quickly, and take to water (or any 'new' thing) easily, but it's important for adopters to realize that it might require a bit more empathy... Although that might be true of any dog :) Thanks so much for coming by! We always had rescue dogs. They need us the most. Our last love was Little Bit. She was the best girl ever because we spent so much time with her. He hated to swim. Not a fan of the water at all and we boat all the time. She went with us, but water wasn't something she wanted anything to do with. Rescue dogs and cats definitely need us the most. It's great that you've always had them. Oh, Sandee—bless you and your family, two- and four-legged :) Yep, rescues really are awesome, and putting the time (and work) in to help them achieve their potential really is its own reward. Kudos to you for making Little Bit feel safe enough to go on the boat with you, in spite of hating the water. Sometimes that's all it takes :) So glad to meet you, and thanks for sharing your experience! All of our last 5 cats have been rescues. Two previous, (now over the rainbow), came from the animal shelter, and the last three, Beyza, Elsie, and Gus showed up at our doorstep, declaring they were now home. We advertised, etc, and we have no idea where they came from, but we're glad they chose us. Oh, Ms. Castillo, thank you for your kind heart! I'm not sure I agree about cats versus dogs. My paternal grandparents took in abused dogs, though, for which I'm very proud. It was just sad how few could be trusted with kids. My desire to love on them was mostly thwarted. ~sigh~ As an adult, I was adopted by a cat off our streets. At the time I had life threatening asthmatic reactions to felines. She inspired me to see a doctor who put me on better medications, and I never felt better. That was in 1999. Luna passed away in 2014, but the cat we got from the Humane Society a few years later and a younger cat dumped near a friend's house after that are in their mid teens now and still going strong. Darla, so very sorry about the late reply! I'm so happy your experience with stray/feral cats has been so positive! May it inspire many, many others around you to take in one—or three ;) And I'm delighted to hear about your grandparents adopting abused dogs; yes, they do come with issues (and kids are a BIG no-no), but—as someone who lives with eight of them—they're totally worth the effort (and the occasional mauling, haha). I really believe there is no love like the (hard-earned) love of an abused animal, regardless of species. Kudos to you for taking Luna—and the two who followed—in! We currently have two rescues. One is missing half of his back paw, but he is such a sweetheart! The other was tossed out during the really freezing weeks right after Christmas as a puppy and we took him in. His jaw is a little askew, but both are tight knit parts of the family. Lol! Only one of ours would have liked being thrown into water, though. How awful that people would toss out a puppy and how wonderful that you rescued him. You are good people. We have one rescue and he's a sweetheart. A little odd acting at times. He's very timid. If there is any sort of yelling or loud noise, he will run and hide in the basement. Sadly, we assume he was abused. We've never forced him out of his comfort zone. He was here for months before we could lure him into the living room with the chaos of a big family and he still lays in the doorway, for a quick escape. But one on one, he's the most affectionate dog. Poor thing :-( So good that you guys took him in. 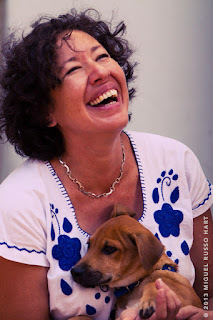 Kudos to Guilie, for being a dog rescuer, having patience, loving and caring for dogs, and writing a book about it. When I met my future husband, he had two rescue dogs. Luckily, they loved the water, as we took them sailing with us for years. They were a part of our lives 24/7, and we even changed boats (from a monohull to a catamaran), just for them. :-) Rescues are the best. What better joy than turning an unhappy doggie life into a happy one, even if it’s challenging at times. It makes the reward even bigger. :-) I hope it all makes sense!